Every year, the Oswego Heritage Council proudly presents the Annual Collector Car & Classic Boat Show. What started out as a handful of local classic cars on display in Millennium Plaza has expanded to a huge show with cars and boats from all over the area. As always, there is no cost for admission to either of the event’s locations. This is the only show in the tri-county area that combines collector cars and classic boats with free shuttles provided between the venues. At George Rogers Park, we showcase collector cars spanning an array of makes, models, and decades. Cars are driven onto the field in the morning on August 19th for public display from 9:00am to 3:00pm with the awards ceremony for the Car Show beginning at 2:00pm. The Lake Oswego Lions Club will put on their pancake breakfast at 7:30am, and lunch starting at 11:00am. This year, our featured Marque is Pre-World War II Classics. The Classic Car Club of America (CCCA) defines Classics or Full Classic Cars as "...fine or unusual motor cars which were built between and including the years 1915 to 1948. All of these are very special cars that are distinguished by their respective fine design, high engineering standards and superior workmanship." With the help of Organizations such as the CCCA, we hope to bring you the best examples of true classic cars. Click here to register a car for the Show! Sundeleaf Plaza is our venue for beautiful and rare classic boats docked for up-close viewing. These watercraft represent years of floating style and elegance. With up to 40 boats on display, each one represents an example of the ﬁnest and most complete classic boat presentations the region has to offer, many of which as wooden masterpieces. 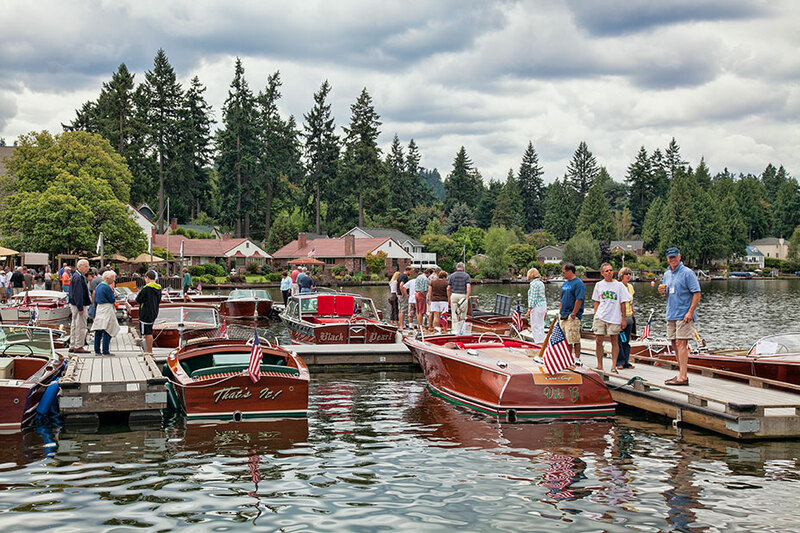 This year, we are continuing with the Poker Run Car Tour for Lake Oswego’s 2019 Collector Car and Classic Boat Show. The Dr. Quinton-Cox Memorial Poker Run Car Tour helps support the Dr. Quinton-Cox Memorial Scholarship Fund and the Oswego Heritage Council Museum. The car tour will take participants to five historic locations around Lake Oswego and beyond. The tour starts at Foothills Park, with participants departing at 30 second intervals between 11:00am and 12:00pm on Saturday, August 25th, and will wrap up by 2:00pm back at Foothills Park. How does a Poker Run work? Every participant receives two playing cards at the tour’s beginning with a $5 donation buy-in. At each of the tour’s stopping points, participants acquire additional playing cards at a cost of $5 each. You can pick up as many as you like at any of the stops to build your best five card poker hand. At the end of the tour, prize baskets will be awarded for 1st, 2nd, and 3rd place poker winners. It is a great tour for a great cause! Click Here To Register for the Car Tour.